Pros: Beautifully staged and performed with incredible joy and skill. Cons: Fans of Django Reinhardt may find his personal story underexplored. 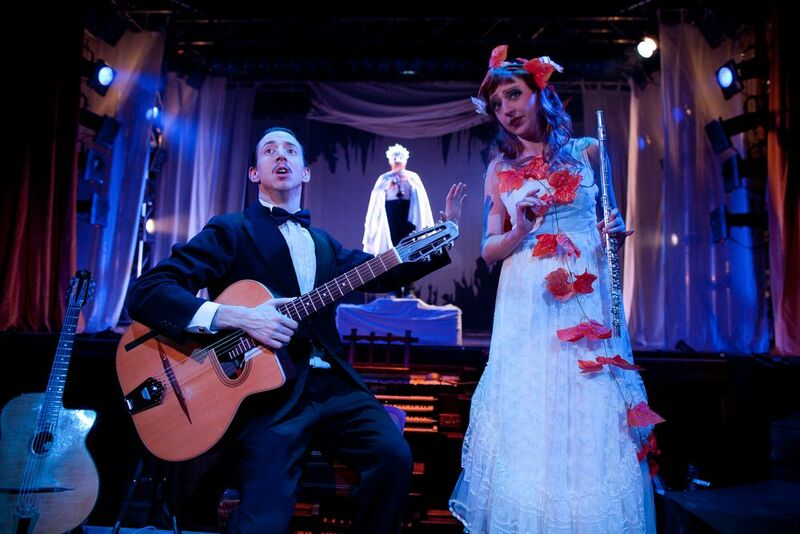 Orpheus is a triumph of musical theatre with exquisite period detail and virtuoso performances. Musical theatre can be a time machine. With the help of skillful performers, detailed design, and an inspiring setting, songs and sounds can transport audiences to other eras and places. Old worlds that would otherwise be lost to history can be recreated, experienced, and enjoyed. To this end, Little Bulb’s new production is not only effective, but a hell of a lot of fun. 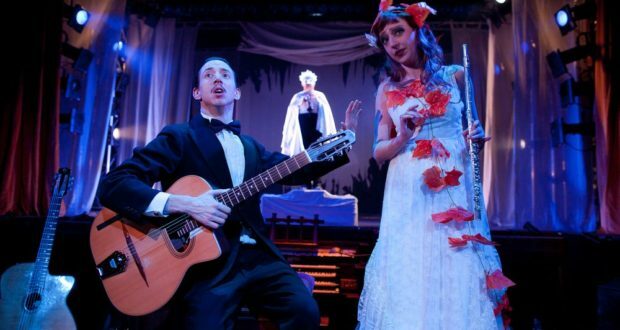 Orpheus is a triumph of musical theatre. Presented and set as a cabaret in Jazz Age Paris, legendary guitarist Django Reinhardt plays the role of Orpheus in a retelling of the famous Greek myth. 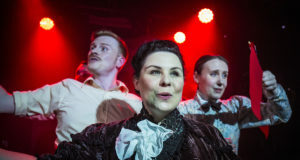 Part-concert, part-show, the production explores this story with ‘hot’ music from the time, dazzling costumes and puppetry, and hilariously observed melodrama. The cast are highly accomplished musicians and stage performers. Dominic Conway naturally deserves plaudits for his blistering rendition of Django Reindhardt, but so too do his co-stars and house band. Yvette Pépin is outstanding in her performance of both Eurydice and Edith Piaf, while Miriam Gould, Shamira Turner, and Clare Beresford excel as singers, instrumentalists, and comic performers – playing everything from woodland critters to the three-headed beast of the underworld, Cerberus. Orpheus is elevated by its remarkable design. Mary Drummond has created magical sets and fantastical imaginings of characters from Greek antiquity. 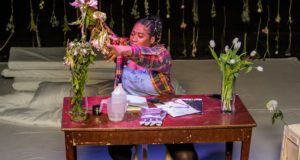 The mask and puppet-work is equally stunning, with enchanting and otherworldly creations provided by Max Humphries and Cheryl Brown. For staging such a glamorous tale, there are few locations as impressive as the Grand Hall of Battersea Arts Centre. True to its name, the venue is both vast and majestically appointed. The Hall provides superb acoustics, which greatly enhance not only the show’s musical numbers but also the choral moments, where the voices of the cast soar against the stone. While it is difficult to find fault with Orpheus, my one reservation would be the treatment of Django’s story. The show introduces the musician and his rise to fame, but then puts his life-story to one side in order to explore his performance as the Greek legend. The show is called Orpheus after all, and so it makes sense that it should be more focused on telling this fabled story. Still, jazz fans may be disappointed by a lack of exploration into Django’s life-story and experiences of 1930s Paris. Orpheus is a pure delight from start to finish. For those looking for a little less ‘oh yes he did’ in their festive entertainment, the show provides an excellent alternative. With music, laughter, and otherworldly spectacle, Orpheus is a trip worth taking.